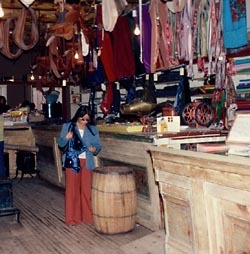 Kurt is the founder and editor-in-chief of NationalParksTraveler.com. 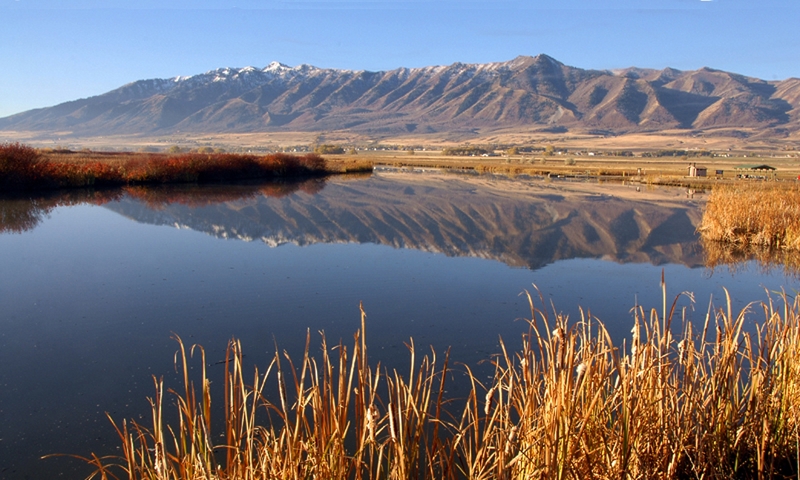 They might catch your eye as they dart under sagebrush. Or maybe startle you with their pushups on a boulder. Odds are, you won’t leave Arches or Canyonlands national parks without seeing a Western Banded Gecko. These lizards can grow to six inches in length, though that’s on the large side, and half of that length might be their tail. Pale-pink and brown-banded translucent skin distinguishes Western Banded Geckos from all other lizards that live in the same desert surroundings, and their heads and bodies are speckled with light brown. The brown bands are vibrant in young Western Banded Geckos, and then change into blotches, or spots, with age. The small scales that cover their body are soft to touch, and their slender toes leave no room for pads. Movable eyelids and vertical pupils also set them apart. The Western Banded Gecko typically are spotted in rocky or sandy desert areas in the American Southwest. 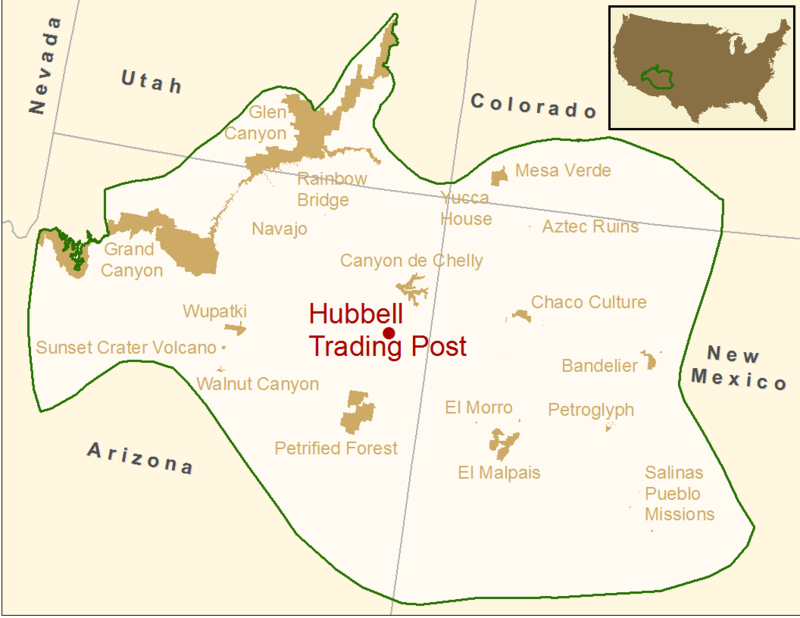 They are fond of open, dry deserts, desert grasslands, and catching the sun in the canyons. 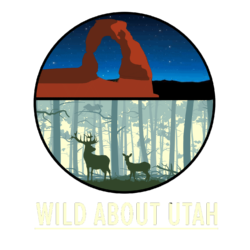 You can spot them, or one of the eight subspecies, in Glen Canyon National Recreation Area, as well as in Arches and Canyonlands. Like other geckos, these lizards generally avoid the day heat and prefer the cool night air. They seek shelter during the day near or under rocks, burrows, and spaces beneath vegetative debris, and even trash piles if necessary. They frequent rodent burrows as they hunt insects, spiders, small arthropods, and baby scorpions. The Western Banded Gecko stalks its prey, capturing and crushing it with its jaws in a final, fatal lunge. 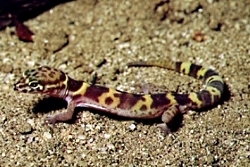 The small gecko is one of the few reptiles credited with controlling the scorpion population, by eating their young. The Western Banded Gecko can also mimic a scorpion, by turning its tail upwards, and waving it to repel predators. In addition to this deception, Western Banded Geckos use other methods to divert predators. Be forewarned: if you plan on catching a Western Banded Gecko, be prepared to hear a squeak or chirp in disagreement. You may even see them detach their tail. Their tail has particular fracture planes, allowing the lizard to easily detach and escape, similar to other lizards. Blood vessels surrounding the tail rapidly close, so they can prevent blood loss. Regrowth of their tails happens quickly, as it is mostly made up of cartilage. Though the tail serves as an easy escape route, it means a lot to a Western Banded Gecko: that’s where it stores its food and water. Their tail allows these animals to survive during lean times, up to nine months. As you can imagine, losing a tail puts their life in danger, so look but don’t touch. Though another national park in Utah is famous for arches, Zion National Park has more than you might imagine. Doubt it? Next time you visit the park, take a good look around. All the elements for arch building are readily on hand in Zion. 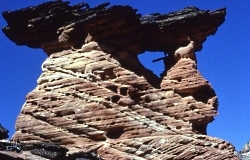 A natural arch is formed when deep cracks penetrate into a sandstone layer. 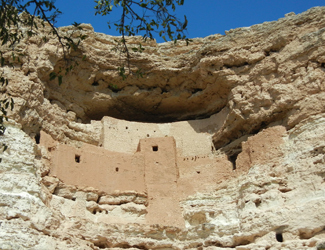 Erosion wears away the exposed rock layers and the surface cracks expand, isolating narrow sandstone walls, or fins. Water, frost, and the release of tensions in the rock cause crumbling and flaking of the porous sandstone and eventually cut through some of the fins. The resulting holes become enlarged to arch proportions by rockfalls and weathering. Worldwide, arches number in the tens of thousands, and probably no place is more suited for their creation than the Colorado Plateau, home of Zion National Park. The vast geology of Zion has created environments as widespread and varied as the topography of the park itself. Hidden in its geologic grandeur are dozens, perhaps hundreds, of freestanding arches of all shapes and sizes. Although freestanding arches may be found in many different types of geologic formations, the Navajo Sandstone formation, which makes up the magnificent cliffs of Zion, provides a fertile setting for the creation of these ribbons of rock. Among the many arches in Zion, two stand out: Crawford Arch and Kolob Arch. 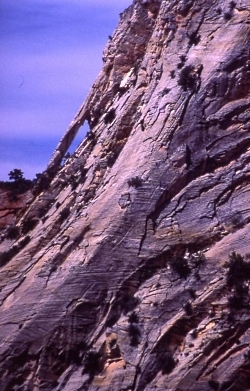 Crawford Arch is the most visible, clinging to the base of Bridge Mountain a thousand feet above the Zion Canyon floor. It’s frequently pointed out to casual observers by an interpretive sign located on the front patio of the Human History Museum. The other famous arch in Zion is not so easily seen. 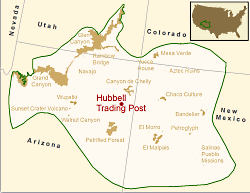 Located deep in the backcountry of the national park’s Kolob Canyons District — it takes a seven-mile hike in to reach– Kolob Arch is hidden in a small side canyon, perched high on the canyon wall. For most of the 20th century, many believed that Kolob was in fact the world’s largest freestanding arch, leading to years of debate and the motivation for various parties of adventurous thrill seekers to climb on and around the massive span in hopes of securing a defensible measurement. The Natural Arch and Bridge Society long has pondered this question, and using lasers and an agreed upon definition of what should be measured says Landscape Arch is the world’s longest stone arch. But don’t be surprised if the debate continues. 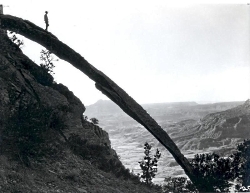 The definition used by the society centers on the “maximum horizontal extent of the opening.” That opening beneath Landscape Arch measures right around 290.1 (plus or minus 0.8 feet) feet across. The opening beneath Zion National Park’sKolob Arch, which long had been in the running for world’s largest, measures 287.4 feet (plus or minus 2 feet), according to the group. 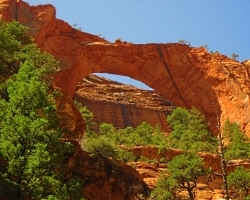 Despite its isolated location, Kolob Arch has become a favorite backcountry destination for thousands of visitors to Zion. They discover what most arch seekers will tell you: while beauty awaits every seeker at the end of the path, the reward begins unfolding at the trailhead. Anxious to see another arch, but not ready for a 14-mile roundtrip hike? Then head for Double Alcove ARch. A 5-mile roundtrip along the Taylor Creek Trail takes you into a narrow box canyon toward the Double Arch Alcove, where erosion has carved out natural openings in the Navajo sandstone.